Jellyfish are among the oldest creatures on earth and one of the most venomous marine animals for humans. Jellyfish have specialized stinging cells with which they inject their prey with poison within microseconds. Some Jelly fish like the sea wasp (box jellyfish, which occurs in Australia), have up to 60 tentacles of several meters in length armed with hundreds of thousands of stinging cells. 98% of the body of a Jellyfish is water. They swim using a form of jet propulsion reaching a speed of 10km/h. Jellyfish have very advance survival skills that may compete with human evolution. In the article “ Jellyfish are taking over the seas, and it might be too late to stop them,” Gwynn Guilford explains how and why Jellyfish overgrowing population is consequence of our misuse of our natural environment. The Jelly fish few predators such sea turtles, salmon, mackerel and albatross are increasingly scarce. As Jellyfish compete with smaller fish for the same food, and also eat those fishes’ eggs, they can collapse entire fish populations. Jelly fish, can put away 10 times its body weight in food in a single day, even though it needs to eat only 16% of its body weight to grow. Not only Jelly fish may have evolved but also Humans are helping them to reproduce. Jelly fish are world-class proliferators reproducing by creating little bundles of clones (Polyps) that attach to hard surfaces waiting for their opportunity to be released as small jellyfish. While they’re waiting, polyps clone themselves, creating more bundles of future baby jellyfish. One reason jellyfish blooms are so disastrous and are almost impossible to get rid of is the capability of exponential reproduction by some species, as well as cells release through post-mortem decomposition, which somehow find each other again to form a whole new polyp (as in Benjamin Button jellyfish). A few centuries ago, the hard surfaces available for polyps to cling included mainly seabed rocks and oyster shells; those polyps that couldn’t find such surfaces couldn’t clone. The proliferation of modern human structures provides surfaces to which polyps can cling to as their new oyster shell. Piers, drilling platforms, plastic cigarette packets, offshore wind turbines, and boats enable Jellyfish ability to bloom in such incredibly rapid fashion and shocking numbers. The intricate lattice of ocean life has kept jellyfish in check. In written human history, jellyfish blooms have never before infested the seas until now. Thanks to overfishing, pollution and other factors, jellyfish populations are exploding into superabundances and exploiting these changes in ways that we could never have imagined. Overfishing of, say, salmon removes one of the jellyfish’s few predators. Jellyfish also wreak havoc on the food chain when they’re introduced to new ecosystems, usually via ballast water that shipping tankers take on and release as a counterbalance to cargo. Other contributors to the jellyfish boom are the “dead zones” created by what scientists call “eutrophication.” That occurs when farming pesticides and sewage pumped into rivers meet the ocean. This affects phytoplankton, the tiny aquatic plants that are the dinner buffet for vast numbers of sea creatures. Normally phytoplankton live on nutrients from chemicals the seabed releases. But their populations explode when doped up on nitrogen and phosphorous, forming algal blooms like the one in Qingdao, China, each summer. The whole food chain starts chowing down, creating more excrement and more dead creatures. Those float to the bottom, stripping the water of oxygen. Since most creatures can’t survive in areas with little oxygen, their numbers fall. As jellyfish need very little oxygen to survive their colonies expand. The best example comes from China, where pollution from the Yangtze River in western China has formed huge dead zones in the East China and Yellow Seas (paywall). Scientists think dead zones are behind the surge in Nomura jellyfish in Japan. 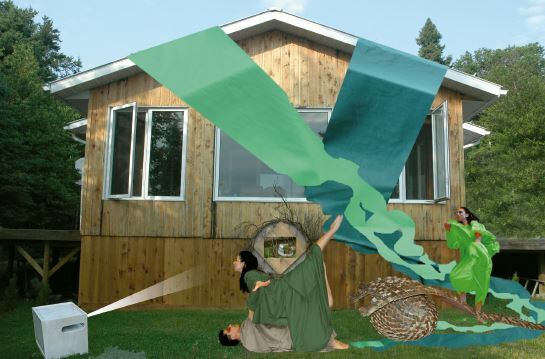 This installation project includes depictions of human and animal interaction sharing the space with equal level of importance and relevance in the composition. My intent is to create a Liminal effect in which the viewer can feel immerged in an underwater scene. The mural 1: two young male figures are framing the composition: on the left side the phoenix female forces embrace and protect the youth and on the right side a similar relation is created by the male forces given by the dragon. The same young man is depicted twice symbolizing the presence of the male and female energies present in every human. In my mind the framing of the composition in this way brings us to the moment of creation in which the egg is fecundated; and when for an instant just before mitosis every person carries both, male and female forces, which then are split to define the gender of this new being. Two spirals are created also on both sides relating to the magical growing system of many organisms in nature like ferns, seashells the galaxy, etc. Inside the spirals both figures in movement and static are grouped related to the spiral form. On the closing of the spirals eternal love is depicted; on the left-side by two seahorses mating and on the right-side two starfish. The groupings of people dance and move on triangular arrangements. Then after the split circle and the two spirals a central square space is left thinking in the universal geometrical forces that control our existence. Circle, spiral, square and the creations of human triangular compositions rule the story. Angels as alien messengers come into scene to protect our continuation and guide us through our own existence. Infinite sea plants and creatures dominate the lower half of the scene. Dancers move and jump all over the place, commanding our attention. Jellyfish swim toward the center in which a central woman touches her own chest and looks at us to make us participants and understand that this is our own story. A light comes from behind to illuminate the space and leaving us with hope from an optimistic message. Mural 2: A diagonal divides the picture space into two triangles; the lower section resides underwater and the other above water. Iconographic symbolism plays an important role in the composition. Above ground a crouching positioned woman, whose feet root her to the water, looks with a concerned glance to what happens in the waters. She pulls from the water a jellyfish with her right hand and with the left hand holds a scarf that partially covers her head. A man, also crouching, also pulls something from the waters, but his attitude portraits him unaware and with no interest on what happens. Three blue jays, the warrior bird, fly around the man’s head to battle into razing his attention. The man and the woman are divided by the presence of the Quetzalcoatl, the Plumed Serpent,” which plays a dominant role as a god, model, myth, historical figure and symbol in ancient Mexican consciousness of Aztecs, Mayans and other cultures. He was an hombre-dios (“man-god”), who incarnated on earth, to bring spirit and matter into harmony. He was a figure that united spirit and matter. His name can be divided into Quetzal, a beautifully plumed bird, and Coatl, a snake or serpent. The quetzal bird represented the spiritual urge to take flight and transcend the bounds of corporeal existence and the serpent represented being grounded in physical reality to the rhythms and cycles of nature. At the tale of the Quetzalcoatl a man and a woman use their bodies to create a circle. And behind the Quetzalcoatl a peacock and an angel extend their winds and seem to be covering and protecting the scene from the bright light of a sunrise. Vanity, represented by the peacock, is contrasted by the humility, associated with angels. Bright reddish stones create the limits between waters and land. The almost radioactive look of the stones heats the space and creates awareness and tension to the scene. Under the water, human-size jellyfish swim along people in a triangular composition. An angel completes the scene on the left side creating a triangular shape with his own body extending his arms and legs to unite the deep sea and the sky. Behind this scene, remains from a stone monumental composition (similar to the Carnac stones) are studied geometrically and represented in red lines to remark that our ancestors were more aware of the importance of aligning our monuments to the stars and create a harmony between everything existing in our planet with the outer space. Equally animals, plants and humans would share the space depending on each other to exist. 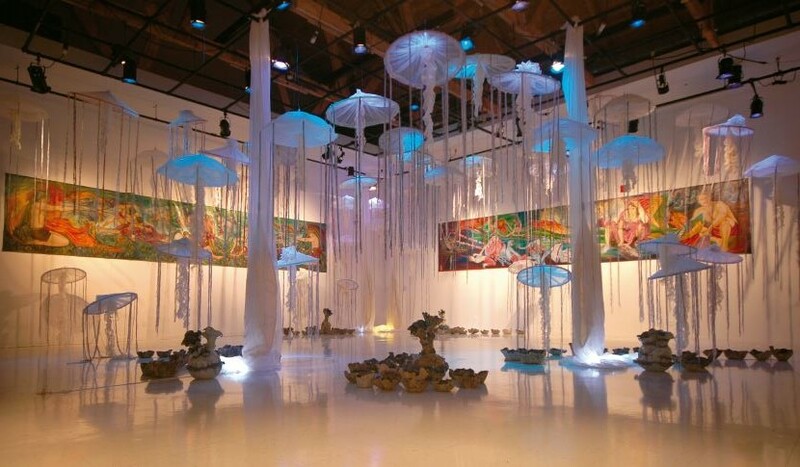 The sea jellies are represented by textile and mixed media pieces plus floating spherical elements. The term medusa refers exclusively to the non-polyp life-stage; the intention of this installation is not only to show the medusa stage, but to also to incorporate different stages of the life spam of sea jellies such as egg, planula, polyp, and ephyra. A group of sea jellies is sometimes called a bloom or a swarm; another collective name for a group is a smack. In spring when sunshine and plankton increase, they appear rather suddenly and often in large numbers, even when an ecosystem is in balance. Swarm usually implies some kind of active ability to stay together. Thus the arrangement on the installation is in spiral groupings. 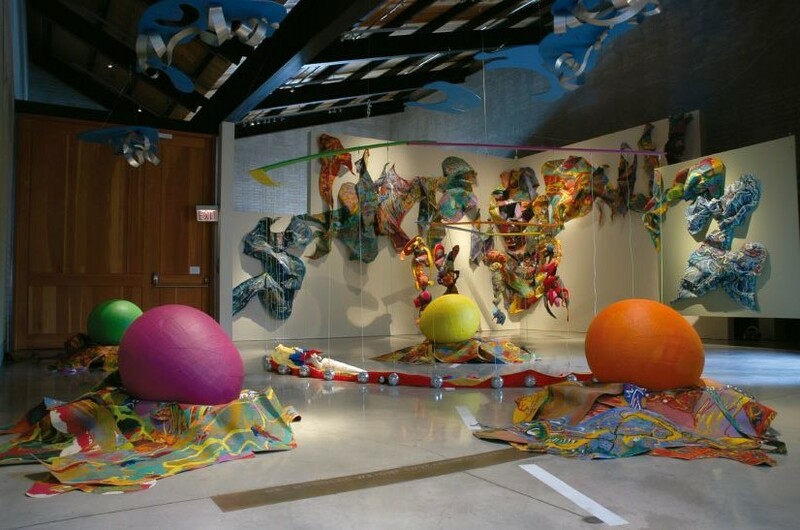 The textile cocoons act as a representation of the ephyrae and are incorporated in the installation to symbolize the bird of a sea jelly represented by dancers and a singer. Male and female medusae reproduce and form thousands of very small larvae called planulae. The larvae then settle on the bottom of the ocean on rocks and oyster shells and form a small polyp that looks just like a tiny sea anemone. Each polyp will bud off many baby sea jellies called ephyrae that grow very quickly into adult medusa. Floor Bells (representing polyps) are used to represent different theories that try to explain the humming of our planet, and why the earth rings like a bell; this sound is known as ‘Earth’s chorus’. One of the theories is coming form the movement of the ocean waters, which is deeply altered when there is an earthquake. And the other theory relates to the solar waves. The solar wind also interacts with the Earth’s magnetic field, causing it to vibrate in sympathy. As charged solar particles hit the inner and outer radiation belts around our planet, they get caught and whipped around, emitting the sounds. 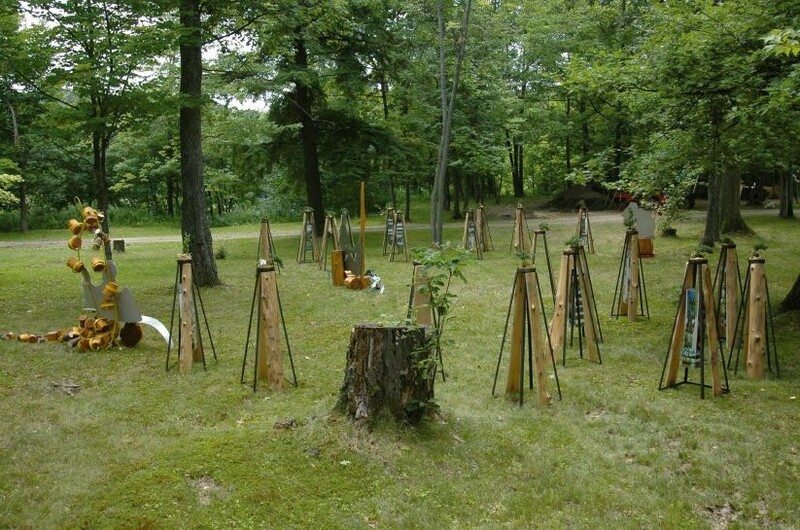 This sound inspired me to create ceramic bells that are placed in this installation on the ground. These ceramic bells when seeing them upside down, look like Ephyra and when placed facing up, look like polyps (the other stage of sea jellies). When hitting the ceramics with a small stick a bell sound is produced. I have also created a series of vases forms, as polyp strobilates, which end on a similar bell, to allow them to be played as musical instruments as well. Written by Cesar Forero and Proofread by Eileen Egerer. The Installation encompasses a large philosophical field by virtue of the form of the work – performance. His work is a performance art that grew out of abstract expressionism. In abstract expressionism, the gesture of the artist leaves behind traces of individual expression that traveled from brain based concept through the movement of the body (particularly the arms) to form a collaboration between material and artist. The material did its viscous, drippy thing as the artist left behind the route of his energy as a physical evidence of how he had moved during the process of creation. Happenings took the intrusion of the individual body further into the art piece to possibly eliminate materials altogether and fix the artwork in the body itself and the energy that the body, or bodies, expressed in time. This brought that added dimension – time – more into play and with it ‘the passing of time’ led to the ephemeral nature of performance. To try and stay this passage and bring the immutable back into the artwork led to documentation of the performance, which in turn became a stand-in for the actual happening. As well, the sets used in the performance became the art pieces. the visual. For Home and Jungle Forero created seven ‘scrolls’ using acrylic on un-stretched canvas. Each can be complete in itself as an art piece. The painted organic canvas forms, from snippets to large threedimensional pieces, also could exist unto themselves. Home and Jungle is most complete when Cesar Forero, Pam Patel, Michelle Moylan and Sandra Clarke are performing. By the same fact, when it is being performed, Home and Jungle is in its least substantial form in terms of being able to be possessed. This defiance against ownership is part of our mortal state and feeds our philosophical field. Being present for the performance is like being in love. There is an aspect to it that you wish could go on forever for it has such energetic intensity but also the understanding that it will fade as an experience adds lustre to its desirability. Beauty has much the same built in dilemma. carnival was practiced primarily in the villages where anything from coffee to vegetable produce to pirituality could be the focus of attention. Lately, the major cities such as Barranquilla, Pasto, and even Bogota have realised the desirability of promoting carnival to further cultural tourism. Home and Jungle is best appreciated with the open arms of an ethnic embrace. It is a holistic sharing of sensibilities where Forero invests absolutely everything that he has to bring forward his creation. Cesar Forero’s exhibition is aptly titled Home and Jungle for his vivacious work encompasses a wide range of imagery embracing everything from the quotidian to the exotic. 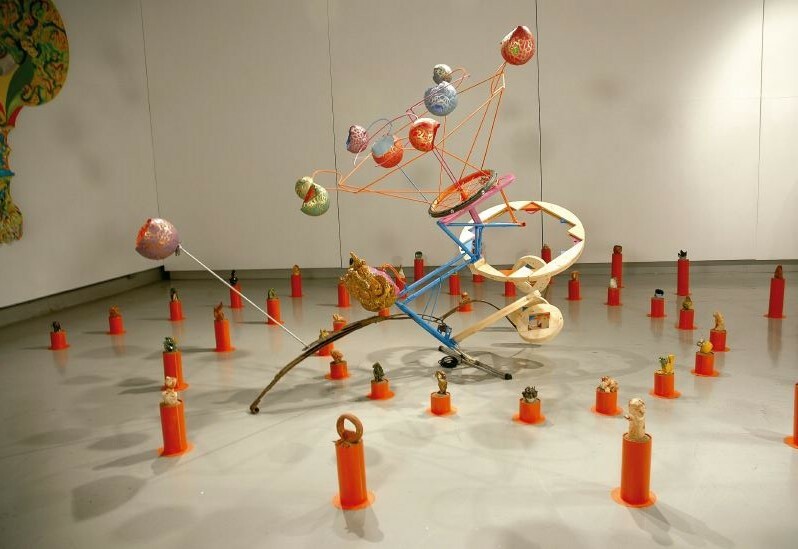 Forero’s work is truly multidisciplinary and accomplished across the disciplines. Earth. Water. Fire. Air. The four elements have been used for centuries as a means of explaining and understanding our existence and relationship to the world around us. 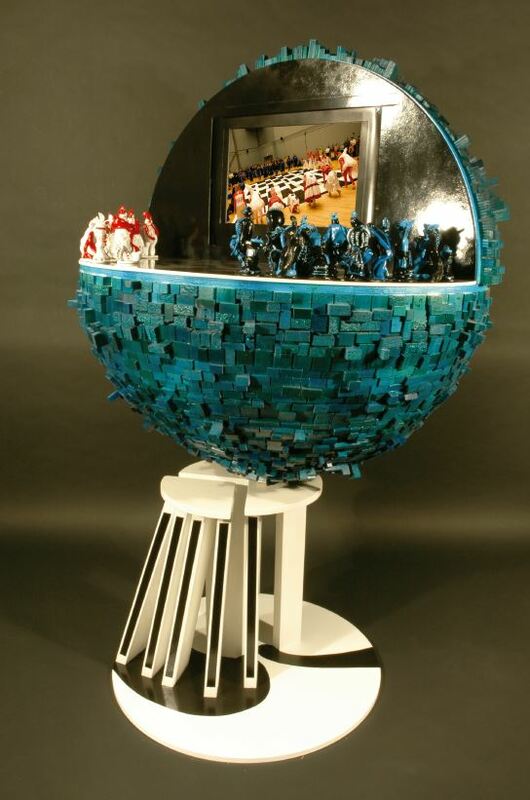 Inspired by this, Cesar Forero has created an incredibly vibrant and dramatic installation that breaks through pictorial and sculptural confines and to physically include the viewer within. Forero draws upon the training he received as an architect, as well as an artist, in creating this environment. His work emphasizes expressiveness and grandeur, achieved through scale, dramatic use of light and shadow, and elaborate decoration. Essentially in a colourful cascade clouds of water appear do descend from the sky, pouring down upon the courtyard walls. Their foam and fury is accentuated through coils of shiny metal affixed to their surfaces which gleam in the sun and cast shadows, creating glorious depth. The waterfall cascade continues down, spilling upon the courtyard floor where seven clay “islands” are placed strategically. Amidst these islands are scattered marbles and brightly coloured bits of ceramic flotsam and jetsam. While they naturally reference the continuance of the aterfall’s flow, they also appear at the same time as the bits and pieces left over after Carnival. 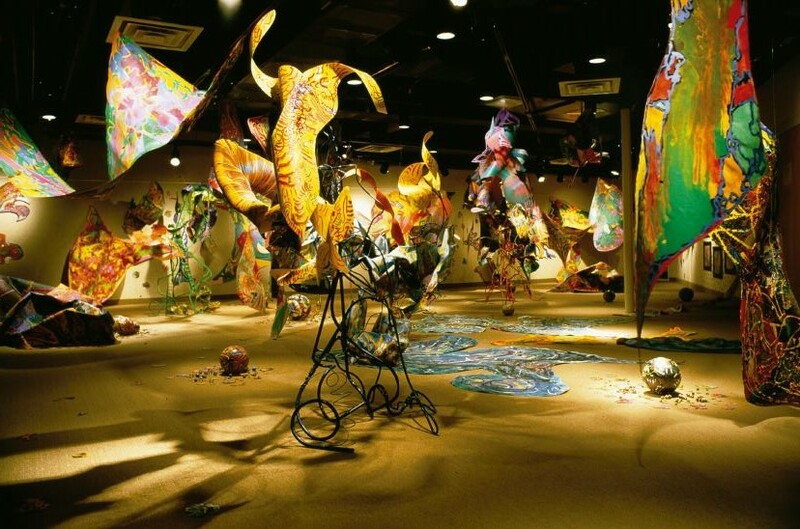 The “islands” sit upon broken ceramic foundations, created with amorphous brightly glazed ceramic pieces. These foundations infer an interrupted landscape of some sort. The “islands” themselves have great earthy presence and seem to be in process of emerging, creating themselves and their shapes from the infinite possibilities offered by the earth. While the islands are undoubtedly organic in feel, there is something very human about them as well. In one sense, the artist has anthropomorphized the very elements themselves, cohesively suggesting that we are all a part of nature and that nature – the four elements – are a part of us. nature and artifice, paradox and transformation. 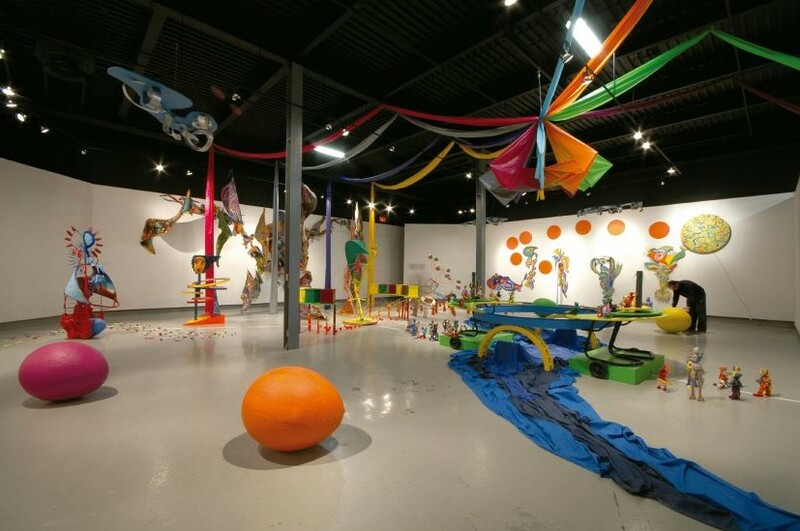 Psychological, playful, spiritual Forero’s works contain all the elements needed to create a truly unique environment. The carnival, which is a major element of Colombian culture, is fundamental to my work. Ultimately, my intent is to make political commentaries on the social roblems that have devastated Colombia and much of the world. The fantastical images and forms I create confront the observer with a periodical reevaluation of reality and the human relationship to society, nature and culture, giving them the possibility to freely engage and question our contemporary reality. world up side down, also part of the concept of Carnivalesque, altered human elationships, allowing the comic ugly mask to be understood as beautiful, and fascination of fear became the main goal of celebration. Researchers link carnival to the urban Greek and Roman rites of bacchanalia and saturnalia. These were period of license and excess. The inversion of rank was the central theme, and slaves were set free and allowed to ridicule their masters. This celebration became the few days of license for laughter and disorder at the end of the winter festival. Later, it was incorporated into the Catholic calendar as the days before the Ash Wednesday, the pre-Lenten feast of Catholic Europeans. Thus, from it appeared the definition of carnival (carnem levare or carne vale). In the hirteenth century the monastic church allowed comical monsters and demons to appear as art pieces mingled in the crowd. In Europe in the 14th century, the twelve days of Christmas (from December to January) were the season when the world turned up side down in a celebration previous to the penitentiary rigor of lent. My Carnival, Image and Duality series explores the double personality expressed in carnivals, revealing the capacity of human beings to adopt a quick new look, an attitude, and the moment to project an elaborated image. Carnivals represent the metamorphosis or change of mankind, creating a new masked identity accompanied by music, dance, traditions, and habits. In carnivals, I see the human attitude expressing its desires, sparkling new appearances, and artistically, creating a game, a fantasy, and a new identity. in these circumstances, this event makes us reevaluate the accelerated lifestyle of the big metropolis, where nobody has time to stop and look after others. I use this event as inspiration and transform it into a childlike game. Two platforms are divided leaving a void space between them. Above the void, a big ring carries a small remote control boat that crosses back and forth, connecting the two structures, one on the east side and another on the west side. The small boat is packed with small ceramic playful figurines representing the children. Meanwhile, some other bigger ceramic figures, representing the adults looking after the children, are placed on both sides. Some are trying to reach their observational perch, others are already positioned. In this parade, most of the figures are not wearing masks. Instead, the masks are being carried on people’s hands, or either have fallen to the ground or have been left behind. Perhaps the message is clear: when a society is looking after its children no mask is needed. The figures free themselves to observe and to protect what is loved: the children. Above the whole composition organic textiles flow because in a devout Catholic town the adults expect this situation to be protected by mysterious sublime forces. paintings pretend to be walking or resting in a street parade. They appear like characters from children’s fables or fairy tales, but when looking at them closely the question of their identity becomes a concern. The enigmatic quality of the various components prompts viewers to explore their personal interpretation and reaction, as happens in the carnivals when one is confronted by a masked individual. The five wall character paintings are urrounded by eight orange circles. 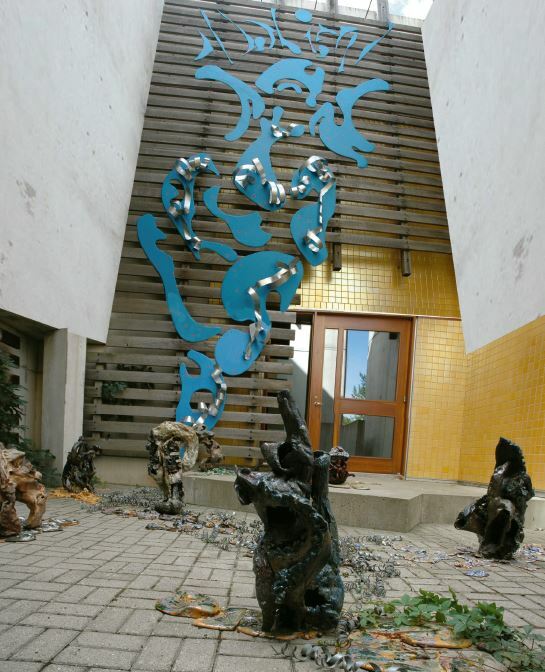 At the end, one of the five characters holds a giant moving circle, making a visual relation with the kinetic central sculpture. The perplexed message of the parade is clear … no matter what happens, or, no matter where we are, we are all part of the same system and it never stops. has no dancers. Instead, a concave mirror appears on the floor and the viewer’s reflection appears upside down and then infinitely multiplied on the mirrored walls. This allows the viewer to become one of the dancing characters trapped inside the boxes. environment, learn from it, and discover how to live within it. It is mysterious that our fear of earthquakes, hurricanes, volcanoes, and flooding, when actually mood, wind, fire and water are the transforming forces that have molded this planet into our living environment. piece. With the creation of both installation and performance, I intend and hope that people become aware of the power of nature. The industrial pollution, slowly poisoning, drying and destroying our planet, is represented on a fragile floor, which keeps breaking as we walk on it. Like coming from nature itself, this installation grows from the four windows of the gallery and develops into the gallery exhibition space. In front of each window a suspended cocoon, seeming a womb, holds and embraces each one of the four abstracted colorful elements. Four dancers take the place of the four elements (earth, water, wind, and fire) at the time of the performance. Coming out from each womb the dancers in colorful costumes and additional objects recreate the strengths of the natural forces while music and dance takes place. The bare feet dancers performing on colorful paintings placed on the floor intent to absorb the viewer’s attention, while a short story is told making us conscious and aware of our responsibility to protect this planet. A series of dramatic situations in Colombia inspired this project. On May 18, 2005, the subversive group “Las FARC”1 placed a horse bomb in front of a plaza. It exploded, blowing apart the poor animal and destroying more than twenty homes and the police station. Fortunately, at that time, no human lives were lost. In July 2002, more than eight policemen were wounded as a consequence of the explosion of another horse-bomb in the town of Guadalupe. A similar event in September 2003 in Chita, Boyacá left eight people dead and more than ten wounded. I intend to show an optimistic position despite the tragedies that are now a common blight in our modern society. I transform this drama into an interactive-dancing narrative presentation. As living sculptures, dancer Michelle Moylan and I are integrated within the scene. 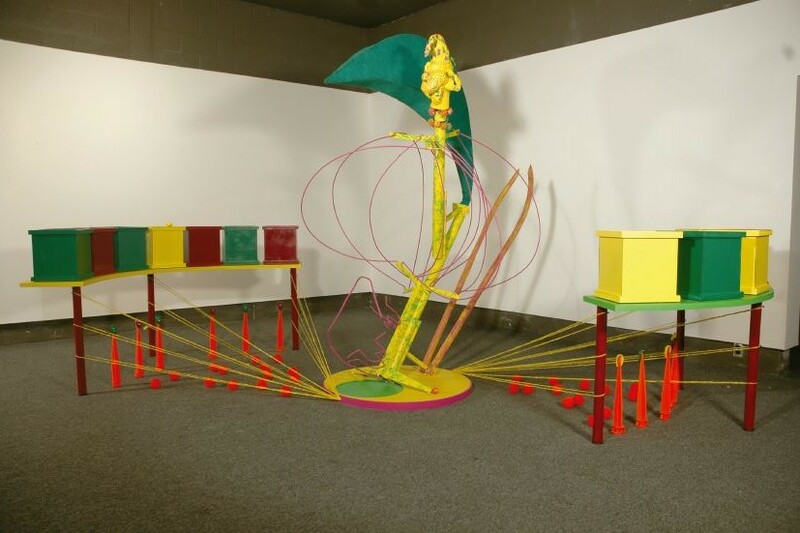 Four more “marionette”-like sculptures are also part of the composition. All six characters are masked and disguised, reminding the viewer of the illusions in a carnival. The colourful costumes draw people’s eyes, distracting viewers from the drama. Further, they remind viewers through their dramatic resence, of violent animal parts such as shark fins and jaws, rooster spurs, horns, thorns, etc. While music plays, dancing and acting take place while the dancer and I interact with the marionette sculptures. A circular glass, whose surface is painted with the world map, a ceramic horse mask, and a small ceramic box, which has two deflated balloons, appear in the scene. The three objects are exchanged between the dancer and me, as part of the dance. Then an actor, as a seventh masked character, ppears. The “actor,” with rough movements, steals the objects and transforms them into estructive weapons. Suddenly, and after an explosion of balloons, the “actor” makes some vocal sounds and uses the ceramic horse mask to destroy the world-map lass. Symbolically, the performers are confronting the viewers with the terrorism and the destruction of our world. As spotlights hit the surface of the broken glass and disco balls, the room itself seems to become part of the broken world’s reflections, or the illusion of a new beginning. Like in a street performance carnival, a social story is told. The whole community participates and gets involved, hoping to make the world a more peaceful and unified place. The chess game started as an elitist game, thus called “The Game of Kings”. It was first played in china and Persia, becoming popular in mid-19th century in England; “The Game of Kings” became the game for everyone as its popularity was augmented by the creation of chess clubs, the distribution of introductory books, columns in the general press, and magazines dedicated to the game. The names of the pieces represent the way in which people lived in medieval times, including peasants as protectors of people of higher ranks, the queen, and the king. When the chess game came out from the courts became popular and widespread as common people started to use and enjoy it. By placing everyone in the same rank and the game allowed to be played for all, the commentary was transformed into a reminder about of the human “social” positions in the world. By being conscious that we are all in the same game; no matter what position, rank, or team we are, we all are part of the same game of life. 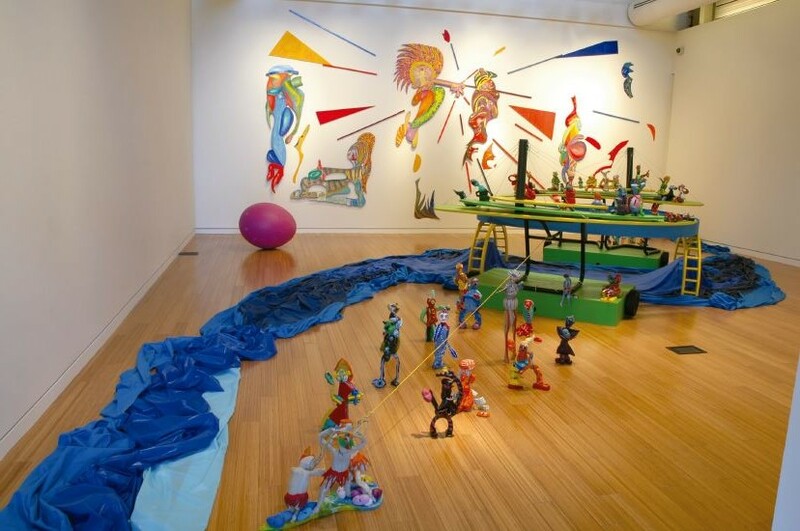 The sculpture houses a carnivalesque chess game and the characters’ roles have been inverted. The idea of “inversion of rank” is highlighted, as the pawns, which are highly decorated and carry crowns, become temporary kings and queens; while the king and the queen are dressed in rags and temporarily become peasants. The court personages have also been transformed in their role. The towers are upside-down, the knights carry their horses on their backs and the bishops have changed into mean characters. This altering of the chess game characters and representation by the dancers makes a statement giving importance to the common citizen as the base of an equalitarian society. The performance looping on the globe shows thirty-two children (from the Carousel Dance Centre) building a chess board. They dance on it and then deconstruct the form into strips and gears, until breaking it completely into irregular forms. The dance is led by dancer Michelle Moylan and artist Cesar Forero; as the players. The role of the players is also altered by not having a specific team; at points they are even being controlled by the chess characters and they mingle with the audience. Audience members are given masks to wear while viewing the performance to ease their transformation into the carnival. Thus, the intention of creating the virtual relationship as a part of the sculptural object; the globe questions our participation and social roles on the planet. No matter where we are our actions affect the place we live. solely for economic gain. New initiatives to find solutions are constantly arising. Some choose to reject technological progress and embrace nature as the only value of existence. Others ignore the environmental situation likely to avoid feelings of guilt towards the consequences of our actions. Perhaps the answer is coexistence. to engage the audience into the sculpture and performance. sculpture remains in the gallery space. A video loop of images of the site and subsequent performances is projected on the gallery wall. This is a collaboration piece created by artist Cesar Forero, dance artist Michelle Moylan, and choreographer Richelle Brown-Hirlehey. The box includes the technical video assistance of Bill Dowling. The music is composed partly by Bruno Lerullo and varies musical selections made by Cesar Forero. Through the mediums of sculpture, installation, video, poetry, and dance performance, the Twisting and Turning collaboration project relates processes of growth and rhythms of existence. As signifier, this project explores the similarities between human and nature, both physically and in a symbolic way. This project includes two parts an installation and an opening performance in which small components of the installation are set up. The project is inspired from having found a death pine tree in the forest in the north of Ontario and its conceptual growing association with the human live. The natural initial growth of this tree was straight and suddenly the trunk had an incredible twisting and turning transition of growth. This makes the tree to have and appealing sculptural form and to represent two different periods and a transition in live. The tree also, and probably for its proximity to a larger tree, grew its branches only on one direction giving to it a front and a back. an additional sculptural component that accompanies the tree. The little miniature sculptures behave as dancers trying to reach the tree turning point. 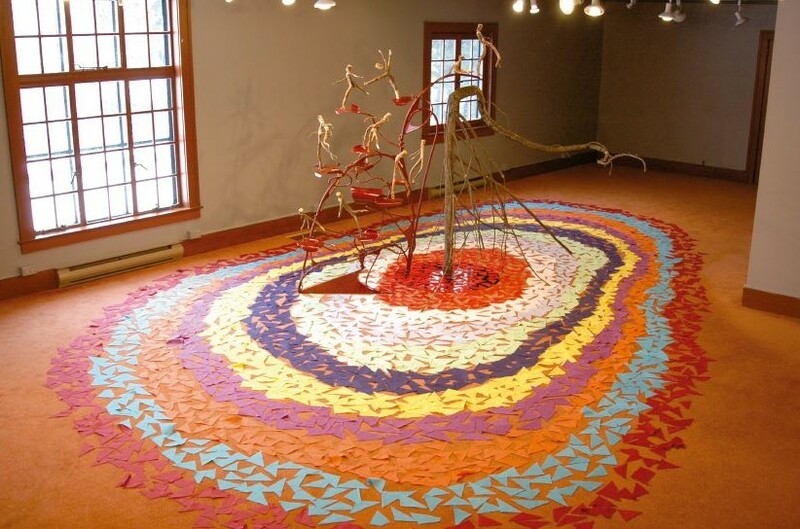 From the growing point of the tree and using it as centre, ten color oval rings are constructed around the tree and on the floor with scattered fragments of textiles, like continuing externally with the internal growing rings of the tree. 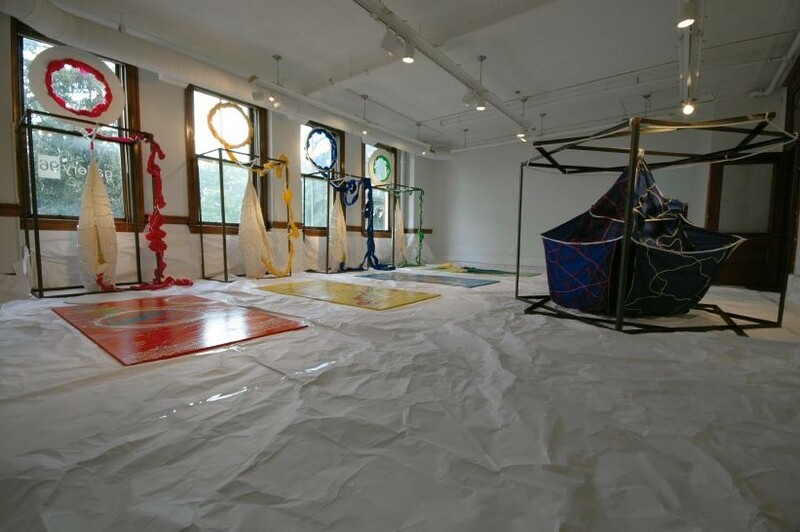 (When the installation is set up outdoors, after the performance the fragments of textiles are replaced by ten rings of varies colorful living annual flower plants.) On the backdrop, a video projection shows the passing of ten of my family members each one at different decades of life. In the transition of the passing of each person on the projection, a fragment of a poem is recited life by poet J. Nichole Noel. The poem creates assumptions about nature, the life of the tree, and our own. As a cycle representing day and night and in costume, Nichole appears ten times from behind the backdrop, walks around the tree, and brings into the installation each one of the miniature branch sculptures. Dancing, Artist Cesar Forero and dancer Michelle Moylan accompany Nichole, and interacting with the audience relates through the dance to Nichole’s words and music. By making the invisible visible and as turning point in our generation this project relates to the contemporary concern of protecting nature. Because we are also nature, the project explores tensions and possibilities of coexistence between humans and nature, relating to it and representing ourselves as nature. Contemporary society is increasingly aware of the environmental degradation in landscapes developed solely for economic gain. New initiatives to find solutions are constantly arising. Perhaps the answer is coexistence. We must accept that humans are a part of nature and explore shared rhythms of existence. Coexistence is then only possible as harmony between natural succession and our need to supply our needs and create space for our comfort and welfare. complex branching passages, with different routes, choices and directions. The outcome from traveling through a maze becomes unpredictable, creating a physical and spiritual understanding of solving and finding the way out. in the space provides time for thoughts and meditation. the dancers along the path of the maze. The music is created by the integration of a percussive industrial soundscape in harmony with Pam’s Voice.